Riley Farrell started vaping when he was just 13 — attracted by the cool vibe, the status, and the youth-oriented marketing. “On Instagram you see dudes blowing O’s and doing all these tricks and having huge clouds and the kids come to school and they want to do that,” he says, standing in the hallway of his high school, West Kildonan Collegiate in Winnipeg. Three years later, Farrell admits to being addicted. But as he learns more about the health risks, he’s trying to kick the habit — and he’s sharing that message with other teens who vape. “I want other kids to see how bad it is and why we shouldn’t. Even if you’re on it, you should get off of it. And if you’re not on it, you shouldn’t start,” he says. Farrell recently did a presentation for a Grade 10 civic leadership class and members of the Students Working Against Tobacco (SWAT) group at his high school. Using a PowerPoint presentation, he explained how the different kinds of e-cigarettes work and the differences between nicotine salts and freebase nicotine in e-juice. Salt nicotine e-liquids allow nicotine to be vaped at higher strengths with a smoother feeling in the throat. Freebase nicotine produces a harsh “throat hit” and producers bigger “clouds” of vapour. You use different e-cigarettes depending on which type of e-juice you’re smoking. “A little lesser-known fact with the juices, when you burn freebase nicotine at too high of a wattage to where it’s burning and not evaporating, that chemical reaction can actually create a type of formaldehyde that you’re inhaling and that’s really bad for you,” Farrell said. He also described what he understands about the health risks of smoking with e-cigarettes, with the warning that this is still a focus of research. 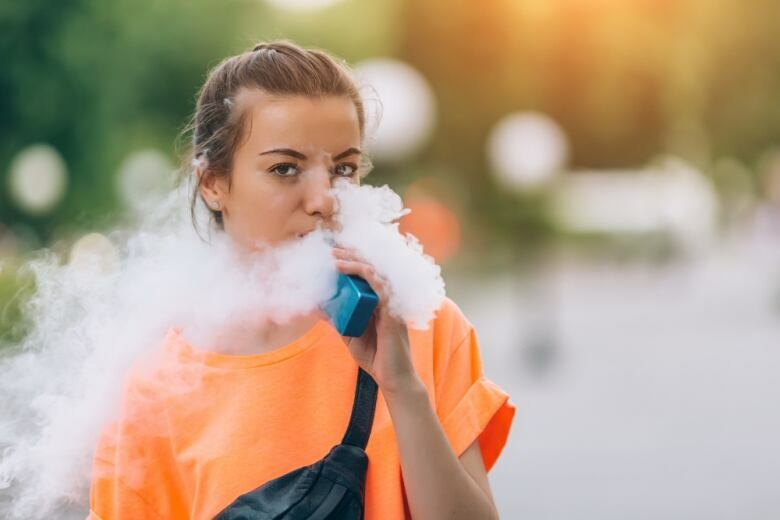 According to the American Lung Association, the chemicals found in e-juice, especially the flavoured variety, can also cause so-called “popcorn lung.” It’s a relatively rare medical condition causing inflammation of the lung tissues, causing breathing difficulties. “You’re getting that shortness of breath and it’s messing with your lungs. That’s not in every single juice but it is a risk,” Farrell tells the class. Then, there are the effects of nicotine. Members of this SWAT group have been doing anti-smoking lectures in middle schools for years — but know they have to update their presentation. “We recognize that vaping is probably a segment that we need to include. But what are we going to say? What’s the message we want to get across to kids?” asks Tammy Harder, the Grade 10 civic leadership teacher and SWAT facilitator. 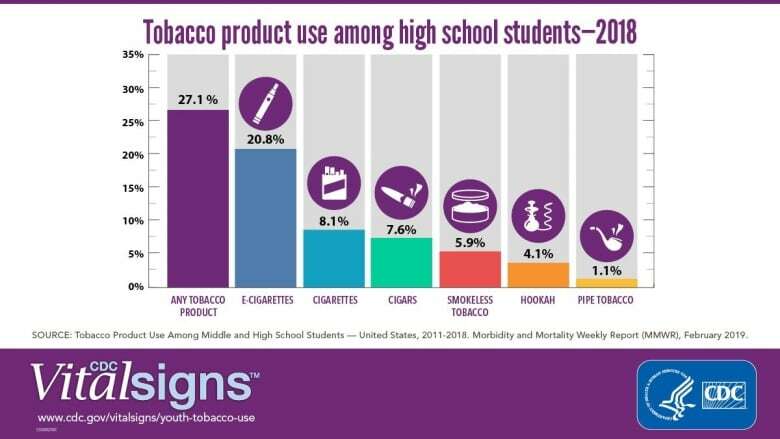 New numbers released by the U.S. Centers for Disease Control and Prevention report about 4.9 million middle and high school students currently use tobacco products, including e-cigarettes. That’s up from 3.6 million in 2017 — and it’s driven by a surge in e-cigarette use. The report found more than 1 in 4 (27 per cent) of high school students and about 1 in 14 (7.2 per cent) middle school students currently use a tobacco product and e-cigarettes are the most common. JUUL is now the most commonly sold e-cigarette in the U.S., though it’s only been for sale in Canada for just over a year. It’s shaped like a USB flash drive and is easy to conceal so they’re being used in school bathrooms and classrooms. JUUL uses replaceable or refillable pods with two strength options, three and five per cent; the U.S. Surgeon General says a full cartridge can contain as much nicotine as 20 cigarettes. They come in flavours like tobacco, fruit, mint, mango, creme and cucumber. Some Canadian research suggests there’s also been an dramatic increase in teenage vaping rates on this side of the border as well. A recent study also found vaping also increases the chance that young people will try cigarettes. The federal Tobacco and Vaping Products Act already prohibits sales of vaping products to those under 18, but Health Canada is looking at strengthening the rules, such as limiting the visibility of ads to young people. It also released a video aimed at young people last week. Fellow student Sydney Tuck hopes if teens hear this message from their peers, they might just listen. Meanwhile, Farrell says parents should also be educating themselves on the hazards and what to watch out for. “If your kid owns an iPhone and there’s a Samsung charger in his room, what’s he using that for?” Farrell says. As well, teens aren’t huddled around doorways, smoking outside. They often vape together in cars with the windows up, Farrell says. E-cigarettes are classified as tobacco products which means vaping is banned in public buildings. Selling it to someone under 18 is prohibited even if it doesn’t have nicotine. That’s not stopping older siblings and friends and even parents from supplying minors — contributing to what may be a new generation of nicotine addicts.